Help I’m Locked Out!! What Information Do I Need to get a Locksmith Quote? One day you may find yourself in a position where you are locked out (or in!) or need a lock changed after a break-in and need to call an emergency locksmith. Calling a locksmith can be straightforward if you know what you’re doing but on the other hand it can be a minefield. If you want someone to arrive quickly you must choose a genuine local emergency locksmith. Our guide on “How to Choose a Locksmith” gives advice on finding a genuine, qualified, local locksmith and how to avoid the many cowboy locksmiths. 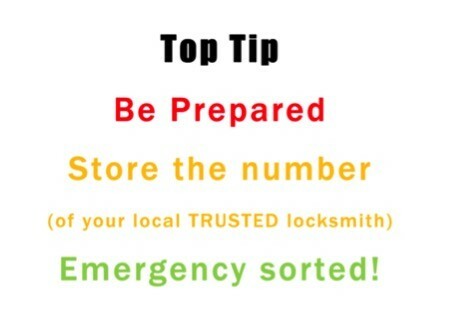 Be Prepared – Take 5 minutes now to save the number of your MLA Approved Local Locksmith (http://www.locksmiths.co.uk/) in your phone so you don’t have to search for one in an emergency. Security is so important and the locksmith industry is unregulated (believe it or not)! It is important to choose the person you are entrusting your security to carefully. A locksmith chosen in a moment of panic could end in regret. Quotes from different locksmiths can vary and this can be quite baffling. If you’re wondering how much a locksmith should charge this post explains why the costs vary, what you should expect and what you should be wary of when you call a locksmith for a quote. Being prepared with a good contact before the event will save you time and stress. When you call a locksmith there are questions that you will be asked and it is helpful if you can have the answers at the ready. Are you locked out of your property or in your property? Are the keys inside the property? Do you have a letter box? Is the door UPVC or wood? Can you send a photo of your lock? Being prepared with the answers to these questions and answering them correctly is important because the price can vary depending on what lock you have. There is a great difference between the time and skill required to open a 5 lever British Standard lock and a rim night latch that has been slammed shut. They are two completely different jobs. A night latch can be opened in very little time and some mortice locks take significantly longer. IKS Locksmiths are a Master Locksmith Association Approved Company. We are 24 hour local locksmiths based in Barnet and operating in the North London area. We always quote a realistic time frame and a competitive price. If you live in the North London area please do record our number in your phone. We would be happy to help in an emergency or attend your property to do a free security survey. It is so important that you carefully select the person you are entrusting your security to. I would be happy to answer any questions you may have.